Wild About Mull - Wildlife Tours on the Ross of Mull - The Isle of Mull for the ultimate wildlife experience! A 'Wild About Mull' wildlife tour is the best way to appreciate what this island has to offer. 'Wild About Mull' operates wildlife tours on the Ross of Mull, which is the south west peninsular of the Isle of Mull. Our minibus tours are led by Bryan Rains, who has over 30 years experience in wildlife watching. Are you a birdwatcher or are you also interested in all forms of wildlife? Come to the wonderful Ross of Mull and discover the wildest part of the island with its rugged coastline, beautiful white beaches, wildflowers and its spectacular range of wildlife. View our blog for the latest sightings. 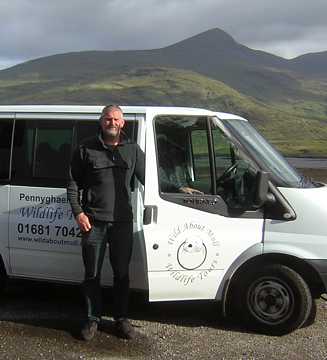 'Wild About Mull' provides the ultimate wildlife experience on the Ross of Mull - in a comfortable minibus. It can carry a maximum of 8 passengers. We are based in Pennyghael, on the south west peninsular of the Isle of Mull and provide minibus tours to take the strain out of your holiday. Let us do the driving and find the wildlife for you! 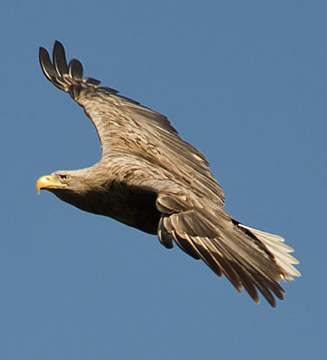 We regularly encounter Golden Eagle, White-tailed Sea Eagle, Otter and Hen Harrier. We'll look for the common species and the rare ones too - Adder, Red Deer, Mountain Hare and fabulous views of breeding waders, at the right time of year. Our tours operate seven days a week, and all year round as required. During the spring and summer months birdwatching is very popular, but as Mull's flora and fauna covers such a broad spectrum you can be sure of a spectacular tour at any time. Please bring your binoculars with you if you have any. We have a telescope and some binoculars for use on the tours. We recommend that you wear stout walking shoes and carry wet weather clothing with you. Tours start at approximately 10 am. We can arrange pick ups on the Ross of Mull prior to 10 am either from your accommodation or nearest road. We provide a packed lunch of sandwiches, fruit and tea or coffee. If you have any special dietary requirements then please let us know in advance. There are regular comfort breaks throughout the day. We aim to have you back at your accommodation or pick up point between 5 - 5:30 pm. Our tour price for the 2014 season is £40 per person . Booking a tour with 'Wild About Mull' is very easy. Simply e-mail us on the link below or call Bryan or Joy Rains on 01681 704229 to discuss your requirements. Book a regular tour, or a bespoke tour just for you. During the spring months, in particular, we can be very busy. Please book early to avoid disappointment. Or e-mail us here. View our blog for the latest sightings. Our regular wildlife tours, for logistical reasons, are restricted to the Isle of Mull. But 'Wild About Mull' are happy to arrange bespoke tours to Iona and Staffa too. Both destinations require short sea crossings and some walking, over and above that normally experienced on our regular tours. Iona is one of the best places to see and photograph the elusive Corncrake, but only at the right time of year. Please contact us for details of availability and a guide to the cost. The advent of digital capture has encouraged many with an interest in wildlife to become keen amateur photographers too. 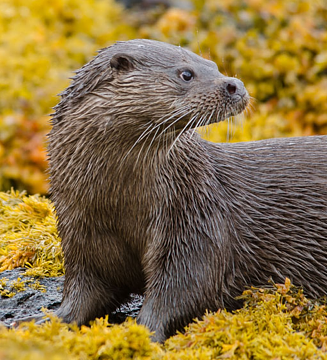 'Wild About Mull' offers you an opportunity to photograph some spectacular wildlife on its regular tours. Bryan often carries his camera alongside his binoculars and you only have to look at the pictures reproduced on the pages of the 'Wild About Mull' blog to see the potential for subjects on one of our tours. But perhaps you're a little keener than the average? 'Wild About Mull' are happy to create a bespoke tour for you. An early start for the best light and wildlife opportunities can easily be arranged. Or perhaps you'd prefer a more relaxed day? With a bespoke tour the pace and structure is up to you. Please contact us for details of availability and a guide to the cost.